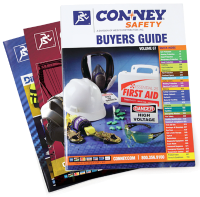 If you need to get a current SDS for a product you purchased at Conney Safety, please try searching our online database using the search tool below. If searching for information on medications, please note that over-the-counter drugs and medications are exempt from the OSHA Hazard Communication Standard and are regulated by the FDA, not OSHA. If you don't see the SDS you need in the above search results, please call 800.462.1947 or e-mail us for additional assistance. These files are available in PDF format. If you wish to view PDF files, you will need a PDF reader like Adobe Acrobat Reader.